It was non-stop action from start to finish on Saturday 3 October, when Suggy’s Gym brought Superstar Fight League 3 : The Road to Glory to the Magnus Sports Centre in Newark. From the opening bout to the closing contest the excitement had the capacity crowd on its feet and raising the roof throughout, in support of local rising stars and seasoned fighters pitted against opponents from some of the leading clubs across the country. Setting the scene for what was to come, NMA’s Jordan Haywood was first up, taking on multiple British champion Blaine Wilson from Combat Academy. At stake was the prestigious ISKA British title, the only one so far unclaimed by Blaine. After five one-minute rounds, an emphatic win by a majority decision gave the 11 year-old from Newark his very first title. 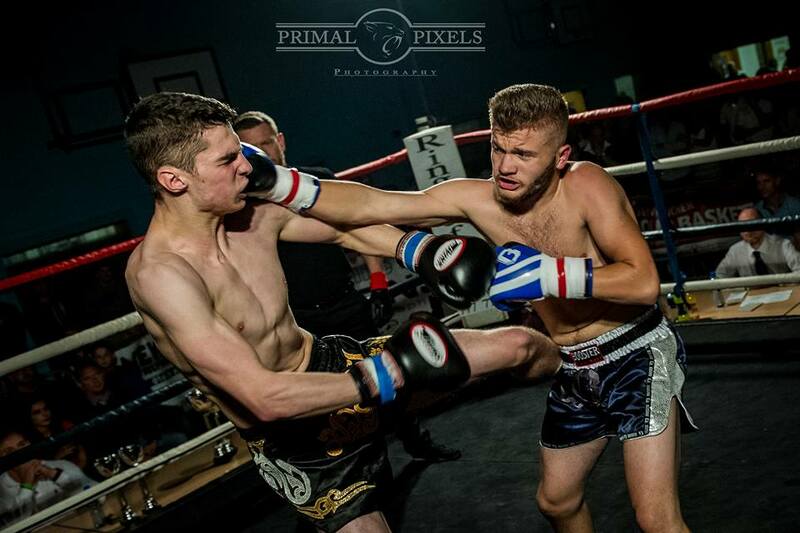 A close and tactical fight between NMA’s Sam Hardy and his older opponent Owen Deakin was declared a demonstration bout due to the significant weight difference between the pair. Then the next two hours saw knock downs, standing counts, a win for NMA’s Tom Rawlinson over Bobby Buckland from Team Mafia and exciting debuts by Newark’s Kieran Duffy and Connor Meanwell. In a back and forth contest against Kane Dirring from Nottingham’s 4th Dimension, stand out debutant Carl Thorpe showed grit and determination. Coming back from a flash knock down when caught with a stunning head kick from his opponent, he went on to mount a fierce assault on Kane which resulted in a standing eight count. At the final bell, the winner of this one was the crowd when the fight was declared a draw. With the main event of the evening approaching, the excitement was at fever pitch and Suggy’s Gym professional Bailey ‘BadBoy’ Sugden did not disappoint. In true Sugden style, the 17 year-old entered the ring like a king, dancing his way through the crowd to deafening cheers from all sides. From the outset, Bailey showed why he is such a favourite with the crowd as he dropped his Russian opponent Modestas Andrijauskas twice in the first round. But to his credit the resilient Nogueira Muay Thai fighter kept on coming, making the three rounds under pro K-1 rules a thrilling contest. With spinning back fists and jumping knees to the head bouncing off his rock solid chin in the second and third, Bailey came right back at Modestas with deadly and powerful punches to match. As the two warriors brought the evening to a close, all the coaches and fighters from earlier on the card were on their feet along with the fans. But there was never any doubt about the result and a unanimous decision gave the victory to Newark’s very own Bad Boy. “With his unbeaten pro record intact and just weeks away from his 18th birthday, Bailey has the world at his feet,” said Suggy’s Gym head coach and proud dad Dean Sugden. “In the post-fight interview with Bailey, commentator Malcolm Martin asked what’s next for him and we were able to answer the question with the announcement of some exciting news. He’ll be celebrating turning 18 when he takes his aggressive fighting techniques into the cage against unbeaten pro Jordan Vucenic in Cannock on Saturday 21 November in a new completely style of combat sport.